New measurements of Martian weather and soil conditions suggest the soil is damp with liquid brine, which can remain liquid when temperatures drop below freezing. The finding contradicts theories that it’s too arid and cold for water on the Red Planet. The measurements, based on a full year’s study of the planet’s temperature and humidity by NASA’s Curiosity rover, indicate that conditions at the Gale Crater are “favorable for small quantities of brine to form.” The brine is created when the salt perchlorate absorbs water vapor from the atmosphere and then lowers the freezing point of water. When mixed with calcium perchlorate, liquid water can exist down to around -70 Celsius. The new measurements suggest that until just after sunrise during winter nights, temperatures and humidity levels are just right for brine to form. 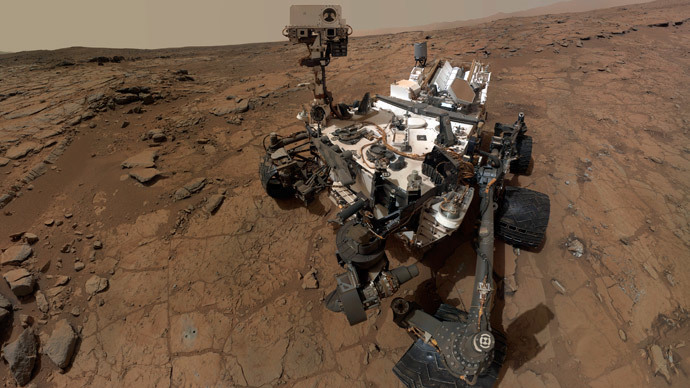 Curiosity first detected the salt perchlorate in 2008 but the weather data studies helped scientists understand that conditions would be high enough to produce brine. NASA said that when relative humidity gets above a threshold level, salts can absorb enough water molecules to become dissolved in liquid. “The soil is porous, so what we are seeing is that the water seeps down through the soil. Over time, other salts may also dissolve in the soil, and now that they are liquid, they can move and precipitate elsewhere under the surface,” Marten Bo Madsen, a senior Mars scientist at the University of Copenhagen, told the Guardian. The weather data, released under the title “Transient liquid water and water activity at Gale Crater on Mars,” was published on Monday on Nature.com. “Gale Crater is one of the least likely places on Mars to have conditions for brines to form, compared to sites at higher latitudes or with more shading. So if brines can exist there, that strengthens the case they could form and persist even longer at many other locations,” said co-author of the report, Alfred McEwen, principal investigator of High Resolution Imaging Science Experiment at the University of Arizona, Tucson, in a statement. The Gale Crater is located just south of Mars’ equator and is 154 kilometers in diameter, with the rim almost five meters high. In the middle of the crater is Mount Sharp, which Curiosity is climbing. Despite this finding, however, life on Mars is improbable. Scientists say if life existed, it died out about one billion years ago. About four billion years ago, Mars lost the benefit of a thick atmosphere and a magnetic field, like on Earth, that protected the atmosphere from cosmic radiation from the Sun. Radiation now penetrates one meter into the Martian surface and would kill even the most robust microbes known on Earth. NASA said that since Curiosity landed on Mars a year ago, it has found evidence of ancient streambeds and a lakebed environment that, more than three billion years ago, offered conditions favorable for microbial life. The rover is examining Mount Sharp for evidence of how ancient environmental conditions evolved.